Sever’s disease is an overuse syndrome commonly seen in immature athletes competing in running and jumping sports. It is also referred to as calcaneal apophysitis or Osgood-Schlatter syndrome of the foot.It was initially described by James Warren Sever in 1912. The basic pathology is repetitive microtrauma from traction of the Achilles tendon at the secondary ossification centre of the calcaneus that causes calcaneal apophysis damage. 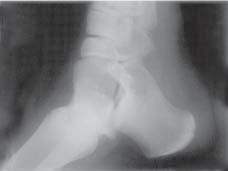 This traction apophysitis is secondary to repetitive microtrauma or overuse of the heel in young athletes. The calcaneus is situated at the most plantar posterior aspect of the foot. The Achilles tendon inserts to the lower, posterior and slightly medial aspect of the calcaneus. The plantar fascia originates from the medial tubercle on the plantar aspect of the calcaneus. Proximal to the epiphysis is the apophysis, where the Achilles tendon actually inserts. The calcaneal growth plate and apophysis are situated in an area subject to high stress from the plantar and Achilles tendon. A shortened triceps surae might also be present as a result of the difference in growth rate between bone and muscle. This occurrence may reduce the cushioning between the foot and the ground. Furthermore, the Achilles tendon has a wide insertion area that is anatomically linked to the plantar aponeurosis. This actually helps to prevent traumatic tears of the ossification centre. Sever’s disease is an osteochondrosis caused by overloading the insertion of the Achilles tendon onto the calcaneus and the apophyseal growth plate in this area. This C-shaped growth zone can become inflamed secondary to repetitive traction stress of the Achilles tendon. Calcaneal apophysitis is a common injury in young athletes and is believed to be caused by running and jumping. Active children and adolescents (usual age of occurrence: 7 to 15 years), particularly during the pubertal growth spurt or at the beginning of a sport season (e.g. gymnasts, basketball and football players), often suffer from this condition. This disease occurs most commonly during the early part of the growth spurt. A boy-to-girl ratio is 2-3:1. None of these causative factors has been tested prospectively and, where tested, none of the measurements has been carried out systematically, and reliability or validity of the measurements has not been considered. This syndrome can occur unilaterally or bilaterally. The incidence of bilaterally is approximately 60%. Posterior inferior heel pain (over the medial and lateral surface of the bone). Pain is usually absent when the child gets up in the morning. The area often feels stiff. The child may limp at the end of physical activity. Tenderness at the insertion of the tendons (= an avascular necrosis of the arthropathy). Limited ankle dorsiflexion range secondary to tightness of the Achilles tendon. Hard surfaces and poor-quality or worn-out athletic shoes contribute to increased symptoms. The pain gradually resolves with rest. Reliability or validity of methods used to obtain the ankle joint dorsiflexion or biomechanical malalignment data are not commented upon, thus reducing the quality of the data. Although pain and limping are mentioned as symptomatic traits, there have been no attempts to quantify the pain or its effect on the individual. Musculoskeletal causes: Achillobursitis, tenosynovitis, ankle sprains or peritendinitis, retrocalcaneal exostosis or bursitis, and plantar fasciitis. All these conditions should be negative to a squeeze test of the apophyseal area. Infective or internal causes: tuberculosis, rheumatoid arthritis, rheumatoid fever, cysts and tumors, and osteomyelitis. These cases often involve other parts of the body, so these diseases can be noticed relatively easy. Traumatic influences: foreign bodies, entrapment of the inferior calcaneal nerve, ruptures of tendon or ligaments, fractures and stress fractures, tarsal tunnel syndrome, and contusions. Other: tarsal coalition. Decreased ROM at the subtalar joint and a negative squeeze test. 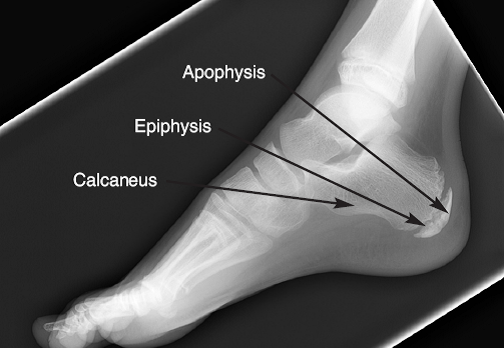 - Radiography: Most of the time radiographs are not helpful because the calcaneal apophysis is frequently fragmented and dense in normal children. But they can be used to exclude other traumas. - Ultrasonography: could show the fragmentation of secondary nucleus of ossification of the calcaneus in severs’s disease. This is a safe diagnostic tool since there is no radiation. This diagnostic tool can also be used to exclude Achilles tendinopathy and/or retrocalcaneal bursitis. Tenderness and to palpation (anterior to the insertion of the Achilles tendon along the posterior border of the calcaneus). Passive dorsiflexion test of the ankle: shows a decrease in dorsiflexion. This test may also provoke a painful reaction. Squeeze test: Mediolateral compression of the calcaneal growth plate to elicit pain in Sever’s disease. Performed over the lower one-third of the posterior calcaneus. This test is the most important to diagnose calcaneal apophystis. Standing tiptoe aggravate the heel pain. Biomechanical abnormalities: pes valgoplanus, forefoot varus, rear foot varus, pes cavus, pes planus, and hallux valgus. Swelling and other skin changes are indicators for different pathologic conditions and are uncommon for Sever’s disease. Although there could be a mild swelling. Gait may be normal; the patient may walk with a limp or exhibit a forceful heel strike. The practitioner should inform the patient and the patient’s parents that this is not a dangerous disorder and that it will resolve spontaneously as the patient matures (16-18 years old). Treatment depends on the severity of the child’s symptoms. The condition is self-limiting, thus the patient’s activity level should be limited only by pain. Treatment is quite varied. () = grades of recommendation. Relative Rest/ Modified rest or cessation of sports. Stretching Triceps Surae and strengthen extensors. Night time dorsiflexion splints (often used for plantar fasciitis, relieve the symptoms and help to maintain flexibility). Heel lifts, Orthoses (all types, heel cups, heel foam), padding for shock absorption or strapping of heel: to decrease impact shock. Advise to wear supportive shoes. Casting (2-4 weeks) or Crutches (sever cases): symptom control. Corticosteroid injections are not recommended. Ketoprofen Gel as an addition to treatment. Symptoms usually resolve in a few weeks to 2 months after therapy is initiated. In order to prevent calcaneal apophysitis when returning to sports (after successful treatment and full recovery), icing and stretching after activity are most indicated. 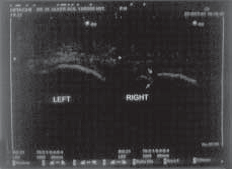 Respectable opinion and poorly conducted retrospective case series make up the majority of evidence on this condition. The level of evidence for most of what we purport to know about Sever’s disease is at such a level that prospective, well-designed studies are a necessity to allow any confidence in describing this condition and its treatment. ↑ Ceylan HH, Caypinar B. Incidence of calcaneal apophysitis in Northwest Istanbul. BMC Musculoskelet Disord. 2018; 19: 267. ↑ Cassas KJ, Cassettari-Wayhs A: Childhood and Adolescent Sports-Related Overuse Injuries. Dallas, Texas, American Family Physician 73: 1014-1022, 2006. ↑ 5.0 5.1 5.2 5.3 5.4 5.5 Scharfbillig RW, Jones S, Scutter SD: Sever’s Disease: What Does the Literature Really Tell Us? Journal of the American Podiatric Medical Association 98: 212-223, 2008. ↑ 6.00 6.01 6.02 6.03 6.04 6.05 6.06 6.07 6.08 6.09 6.10 6.11 6.12 6.13 6.14 James AM, Williams CM, Haines TP. Effectiveness of interventions in reducing pain and maintaining physical activity in children and adolescents with calcaneal apophysitis (Sever’s disease): a systematic review. J Foot Ankle Res. 2013; 6: 16. ↑ 7.0 7.1 7.2 7.3 7.4 Elengard T, Karlsson J, Silbernagel KG. Aspects of treatment for posterior heel pain in young athletes. Open Access J Sports Med. 2010; 1: 223–232. ↑ Hosgören B, Köktener A, Dilmen G: Ultrasonography of the Calcaneus in Sever’s Disease. Indian Pediatrics 42: 801-803, 2005. ↑ 9.0 9.1 Leri JP: Heel Pain in a Young Adolescent Baseball Player. Journal of the Chiropractic Medicine 3: 66-68, 2004.